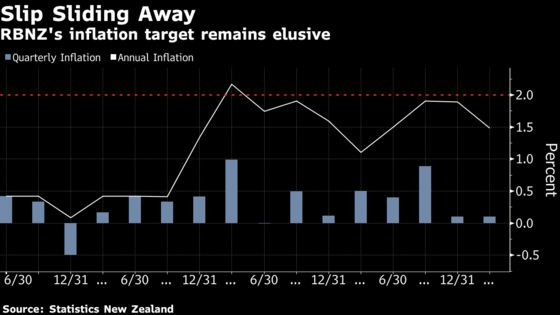 (Bloomberg) -- New Zealand inflation slowed more than economists forecast in the first quarter, prompting traders to increase bets on an interest-rate cut and sending the local dollar plunging by more than one U.S. cent. Non-tradable prices, which aren’t influenced by the currency, rose 2.8 percent from a year earlier -- the most since the first quarter of 2014. Tradable prices fell 0.4 percent from a year earlier.